I don't really stay abreast of the latest fabric lines. 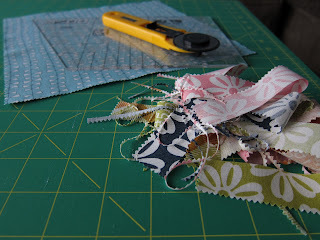 More often then not, I am late to the party after a line is released and I see what everyone else has done with the fabric. Such was not the case with Sweetwater's Lucy's Crab Shack line. As soon as I saw the whimsical name print, the kite strings, the vivid colours, the BICYCLES!! !, and the plaid I was a total goner! I immediately began stalking various on-line retailers anxiously awaiting its release. 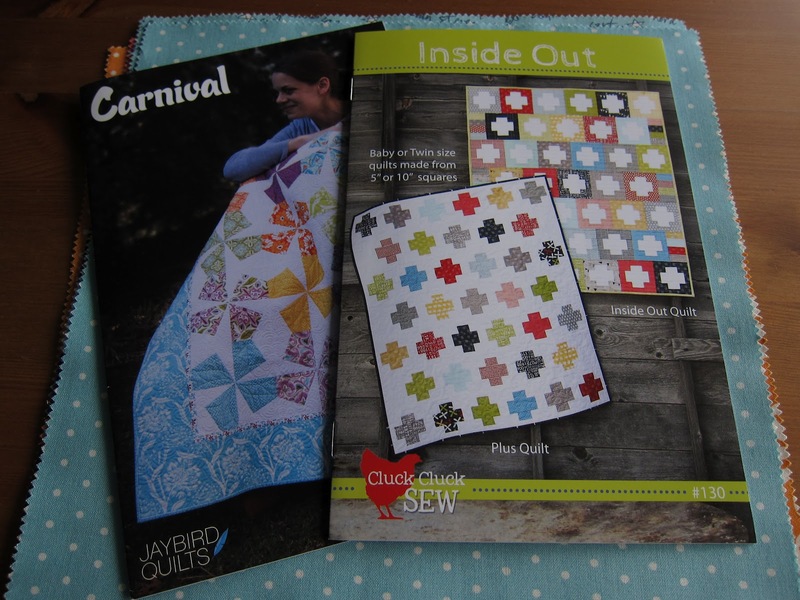 Since I was on a bit of a fabric diet at the time, I ended up settling for a gorgeous layer cake and figured it would be enough to make two patterns that I've had my eye on while still leaving a few scraps for the stash: Jaybird Quilts' Carnival and Cluck Cluck Sew's Inside Out plus quilt. 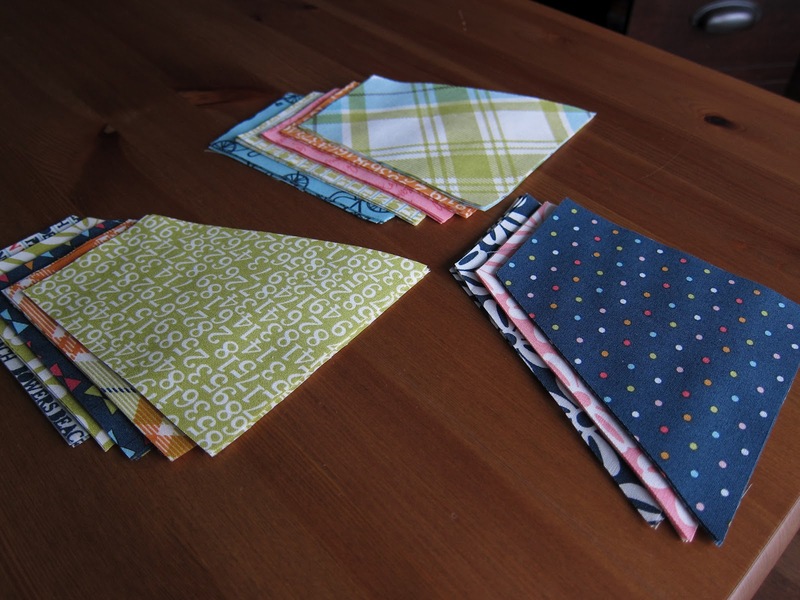 After spending a few hours yesterday carefully sorting the layer cake into two piles (one for each quilt), I started cutting for the blocks for Carnival using my lazy angle ruler. 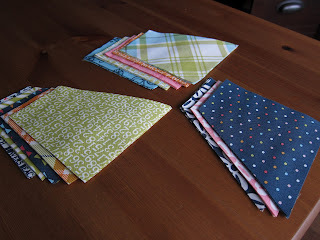 I still have a few more fabrics to cut before I can start getting the background fabric cut. Hopefully by the end of the week, I'll be able to start piecing the blocks. For now, it's back to the cutting mat! Hi Amanda--You are a no-reply blogger, so I'm posting here. 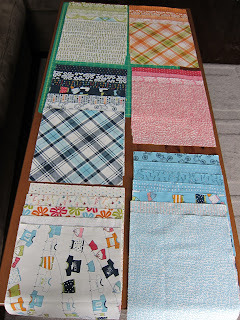 Thank you for the info on Jenny's ruler's new block on Fat Quarterly. Both of the patterns Carnival and Inside Out are on my list to get done. Thank you for the inspiration!